Eyelash extensions are typically very delicate. Those who have them professionally applied are told to stay away from mascara, oil, oily cleansers, and false eyelash adhesive, for any of these substances can do damage to the fine hairs. In this article, we will explain clearly how to remove false eyelashes, so that the next time you go to the salon and get this procedure done, you will know what to do if you no longer want your false eyelash extensions. One thing to note, this article is not about how to remove false eyelash strips, meaning the ones that you can apply at home with a strip adhesive. The easiest way to remove these strip false eyelashes is by using a makeup remover to soften the adhesive and gently tugging the strip off, starting at the corners. It should not be difficult to pull off once the makeup remover has been applied. We must say, that although the methods we are about to offer do work, the long-wear individual eyelash extensions are best removed by a professional at a salon, but not everyone has the money to pay for this process, for it can become costly. The first method that can help you remove eyelash extensions at home, is the steam and oil way. The first step to removing fake eyelashes using this method is to remove your already applied makeup. Be careful around the eye area where your lashes are in contact with the sensitive skin on your eyelids. It is best to remove makeup with special makeup wipes, but light oils and a cotton ball also work. Steaming your face helps to unclog pores and is a pleasant treatment for your skin. It also helps to loosen the eyelash adhesive that is holding your individual eyelash extensions on. The glue used at professional salons is extremely long lasting, and for this reason, it takes some effort to break the bond between your natural eyelashes and the fake added on hairs. You can steam your face by boiling a few cups of water, pouring it into a bowl, and holding your face above the steam rising from the water in durations of 30 seconds or so. Place a towel over the back of your head to create a tent-like area that can help to hold in the steam. You can also add in a couple drops of your favorite essential oils if you would like the process to have an aromatherapeutic effect. Wet a cotton ball with olive oil or any other type of preferred light oil from natural origins, and gently touch it to your eyelashes, using soft rubbing motions and applying the oil generously to the lashes. Be sure to get the actual hairs of your lashes oily and not just the lash line itself. As you are wiping, you will start to see your eyelashes extensions falling off. Continue to apply oil until they are mostly gone. Be careful with the oil, because whenever you apply oil near your eyes, it can cause your vision to be blurry for a bit. You can help your vision go back to normal faster by applying eye drops, which will wash away some of the oil near your eyeballs. Using a gentle face cleanser or just water, wash your face, making sure to rinse your eyelashes as well to get some of the oil off, or to remove any of the eyelash extensions that were left behind. If you do not want to use the steam and oil method, or if for whatever reason you felt like the method did not work well enough for you, it is possible to remove professional eyelash extensions with a specialized product. Remove glue from eyelashes using glue remover, which can be purchased at most beauty shops and possibly even at most drug stores. Your local drugstore should sell a specialized eyelash glue remover, which will have a smell similar to nail polish, for this substance is a mild solvent. Read all the safety instructions included with the product before use, and if you know your eyelash technician, possibly ask them which brand of solvent they normally use for removal, because this type could possibly work best with the glue they applied the lash extensions with. Remove all of your eye makeup using a removing cleanser or wipe, and take extra care to get rid of all eyeliner and mascara. In order to apply the remover to the right area of your eye, you will need to be able to see the exact placement of your natural lashes in relation to where the bond of the adhesive and eyelash extension is. Take a cotton ball and apply the adhesive remover onto it, taking care to use plenty of product so that the entire ball is damp. Close one eye and use your fingers to pull down the upper lid of your lashes, so that they are pointing downwards and the lash line is more easily visible. 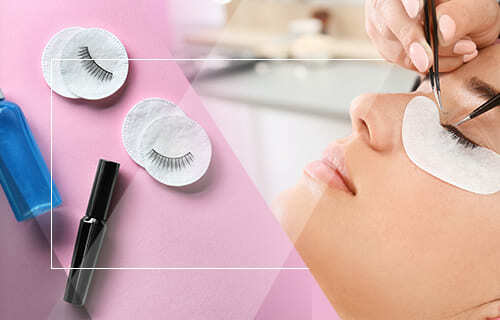 Beginning at the outer corner of your eyelid, rub the soaked cotton ball in small, gentle circular motions across the lash line where the eyelash extensions meet your natural lashes, going back and forth until the area has been well worked. You may want to repeat this process about 15-20 times back and forth before continuing on to the next step. Take care to be gentle with your natural lashes when pulling out loosened extensions. You never want to tug or pull very hard on your natural lashes, and if the glue remover worked correctly, the eyelash extensions should easily slide off your lashes. Remove each extension by hand using your thumb and forefinger, and watch as more lashes continue to effortlessly slip off your natural hairs. After you have finished collecting the eyelash extensions off of your lashes, there will likely be some adhesive left over. Give your lash line one more pass over to dissolve any of that leftover glue and just to make sure that it won’t be left on your natural hairs. To take away any further residue, rinse your face and eye area with warm water and a mild cleanser, or simply with just warm water and gently pat your face dry. All of the glue remover and glue should be gone from your natural lashes by this point. As we mentioned at the beginning of this article, the very best way to get your eyelash extensions removed is at a salon, preferably the one where you got the extensions in the first place because they will know which solvents work best with their specific glue type and eyelash brand. This method is, unfortunately, more costly than the other two options, but it is the way that you are guaranteed a complete removal of your professional eyelash extensions. Normally professional eyelash extensions are applied with a special, extra strong hold super glue made for cosmetic purposes, which is what makes it so challenging to remove the extensions once they are on. If for whatever reason you are not happy with the way your extensions look, if you don’t like the way your outgrown extensions look, or if you are experiencing some sort of pain, it is best to go back to the technician that applied your extensions initially and explain to them how you feel. If they did something incorrectly, technicians are normally quick to remove the extensions and resolve the issue, which is why it would be wise to go back to your initial eyelash professional, or if you simply want any left lashes gone you should also go see your lash tech. Eyelash extensions professionals have all the right tools and solvents to make the removal process a breeze. If you happened to experience an eyelash extension application that was not done correctly, or if you are not happy with the final result because something just looks off, it is wise to consider going to a different salon or technician for the removal. Sometimes individuals who are still practicing and learning the eyelash extension process offer discounted rates, but this procedure is one that you will want an extremely qualified individual to complete, for super glue can be dangerous if applied incorrectly. With that being said, you should absolutely get in contact with a new, reputable salon if you are experiencing pain around your eyes or along your lash line. The specialized glue used during extensions could have ended up somewhere it should not have, which leads to discomfort and possible damage to natural lashes. If you had a bad experience with professional eyelash extensions, simply want them removed, or no longer want to wear them, then you are likely looking for the best way to go about removing your extensions. We hope this article was able to provide you with some options so that you can decide which selection suits you best. The steam and oil method is definitely the least expensive and can be done with just household ingredients, but it requires more time and sometimes the application must be done again to get any lashes that did not come off the first time around. Using specialized eyelash glue remover requires a trip to the store and costs a bit more than the steam and oil method, but it is extremely effective and the application process does not take too much time. At the end of the day, going to a salon and getting your eyelash extensions removed professionally is the absolute best method, but this takes time and usually costs quite a bit of money. Ultimately, it is up to you to decide what is best for you. Just weigh the pros and cons of each option, and you will soon have successfully removed your eyelash extensions. If you feel like your natural lashes are unhealthy after the extensions, or if they seem more fragile or thin, using castor oil nightly along your lash line can help to stimulate growth once again, and nourish your already existing lashes, strengthening the delicate hairs.